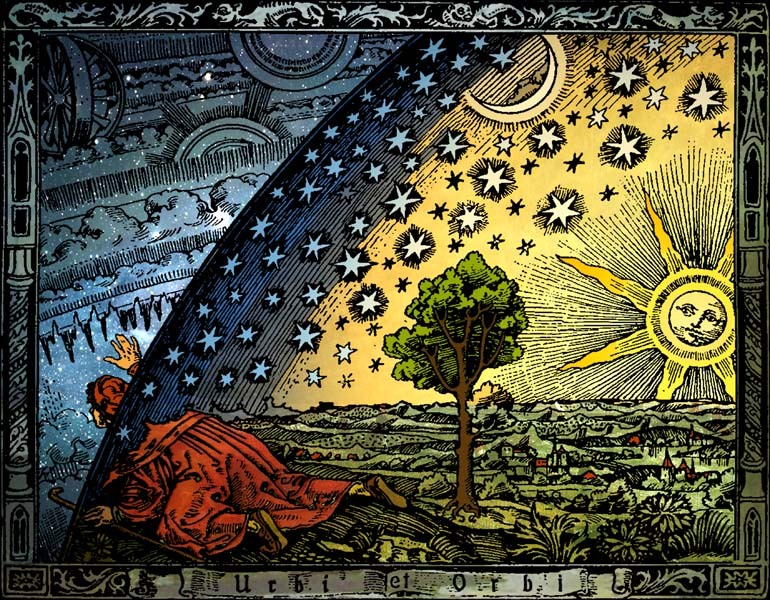 The Akashic records (Akasha is a Sanskrit word meaning "sky", "space" or "aether") is a term from theosophy denoting a collection of mystical knowledge encoded in a non-physical plane of existence. The Records are supposed to contain allknowledge, including all human experience, held in the Universe. The Akashic Records are metaphorically described as alibrary and are also likened to a universal computer or the 'Mind of God'. The records are supposed to be constantly updated. The concept originated in the theosophical movements of the 19th Century, and remains prevalent in New Agediscourse. A theosophical term referring to a universal filing system which records every occurring thought, word, and action. The records are impressed on a subtle substance called akasha (or soniferous ether). In Hindu mysticism this akasha is thought to be the primary principle of nature from which the other four natural principles, fire, air, earth, and water, are created. These five principles also represent the five senses of the human being. An example of one who many claimed successfully read the akashic records is the late American mystic Edgar Cayce. Cayce did his readings in a sleep state or trance. Cayce's method was described by Dr. Wesley H. Ketchum who for several years used Cayce as an adjunct for his medical practice. "Cayce's subconscious...is in direct communication with all other subconscious minds, and is capable of interpreting through his objective mind and imparting impressions received to other objective minds, gathering in this way all knowledge possessed by endless millions of other subconscious minds." Apparently Cayce was interpreting the collective subconscious mind long before the psychiatrist Carl Gustav Jungpostulated his concept of the collective unconscious. Believers in the existence of the Akashic Records assert that they were accessed by ancient people of various cultures throughout history. Despite this claim, there are not any direct references to the Akasha to be found in any of the historical documentation of the aforementioned groups. The term Akasha itself, along with the concept of an aetheric library, originated with the 19th century movement of theosophy. Individuals who claimed to have consciously used the Akashic Records include: Charles Webster Leadbeater, Annie Besant,Alice Bailey, Samael Aun Weor, William Lilly, Manly P. Hall, Lilian Treemont, Dion Fortune, George Hunt Williamson,Rudolf Steiner, Max Heindel, Madam Helena Petrovna Blavatsky and Edgar Cayce. According to believers, the Akasha are the library of all events and responses concerning consciousness in all realities. Everylife-form therefore contributes and has access to the Akashic Records. Any human can become the physical medium for accessing the Records, and that various techniques and spiritual disciplines (e.g., yogic, pranayama, meditation, prayer,visualization) can be employed to achieve the focused state necessary to access the Records. Just as conventional specialty libraries exist (e.g., medical, law), adherents describe the existence of various Akashic Records (e.g., human, animal, plant, mineral, etc.) that in their summation encompass all possible knowledge. Most writings refer to the Akashic Records in the area of human experience but adherents believe that all phenomenal experience as well astranscendental knowledge is encoded therein. The Records have existed since the beginning of Creation and even before. The Vedas of Hindus and the language of Sanskrit itself were extracted from Akasha. Jane Roberts in the Seth books describes a different version of a similar idea when Seth asserts that the fundamental stuff of the universe is ideas and consciousness, and that an idea once conceived exists forever. Seth argued that all ideas and knowledge are in principle accessible by "direct cognition". Direct cognition shares semantic congruency with intuition and allows for the possibility of direct knowing without time elapsing and without knowledge needing to be transferred e.g. in speech or text. This is similar to what Robert Monroe refers to as rotes in his out-of-body book trilogy. William Butler Yeats’ A Vision describes four Faculties which are four levels of human memory; these can be considered the human section of the Akashic Records. Every thought or action taken by every sentient being every moment is both shaped by the totality of the Akashic Records, and at the same time gives a little tug to the direction that universal memory is heading in, just as each drop helps fill a bucket. According to Max Heindel's Rosicrucian writings, the Memory of Nature (Akashic Records) may be read in three differentinner worlds. In the reflecting ether of the etheric region there are pictures of all that has happened in the world - at least several hundred years back, or much more in some cases - and they appear almost as the pictures on a screen, with the difference that the scene shifts backward. The Memory of Nature may be read, in an entirely different manner covering the essence of a whole life or event, in a higher world, in the highest subdivision of the Region of Concrete Thought of theWorld of Thought, and, last, it may be read in the World of Life Spirit, covering events from the earliest dawn of our present manifestation, but only spiritual adepts, spiritual entities and through grace is access to the Records granted. In Michel Desmarquet's book Thiaoouba Prophecy, the author claims to have been abducted by supreme alien beings, that in one part of the book guides him through something that is most likely the Akashic records. The term they are using ispsychosphere. The author's understanding is that the psychosphere is like a "vibratory cocoon, which turns at a speed seven times that of light. This cocoon acts as a blotter, as it were, absorbing (and remembering) absolutely every event occurring on the planet. The contents of this cocoon are inaccessible to us on Earth - we have no way of ‘reading the story’"
The Urantia Book asserts validity and reality of these "Living Records" in several accounts. In Paper 25 is found the statement-"The recording angels of the inhabited planets are the source of all individual records. Throughout the universes other recorders function regarding both formal records and living records. From Urantia to Paradise, both recordings are encountered: in a local universe, more of the written records and less of the living; on Paradise, more of the living and less of the formal; on Uversa, both are equally available." "The Memory of Mercy is a living trial balance, a current statement of your account with the supernatural forces of the realms. These are the living records of mercy ministration which are read into the testimony of the courts of Uversa when each individual's right to unending life comes up for adjudication, when "thrones are cast up and the Ancients of Days are seated. The broadcasts of Uversa issue and come forth from before them; thousands upon thousands minister to them, and ten thousand times ten thousand stand before them. The judgment is set, and the books are opened." And the books which are opened on such a momentous occasion are the living records of the tertiary seconaphim of the superuniverses. The formal records are on file to corroborate the testimony of the Memories of Mercy if they are required. " In The Law of One, Book I, a book purported to contain conversations with a channeled "social memory complex" known to humans as "Ra," when the questioner asks where Edgar Cayce received his information, the answer received is, "We have explained before that the intelligent infinity is brought into intelligent energy from eighth density or octave. The one sound vibratory complex called Edgar used this gateway to view the present, which is not the continuum you experience but the potential social memory complex of this planetary sphere. The term your peoples have used for this is the "Akashic Record" or the "Hall of Records." One of the implications of the existence of the Akashic Records is that perhaps all of us are stars in an epic reality film series?